Juggalo history began one evening in 1994 at an Insane Clown Posse (ICP) concert. 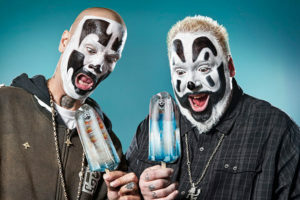 During the song “The Juggla,” ICP’s two lead singers, Violent J and Shaggy 2 Dope, called their fans ‘Juggalos’ for the first time. 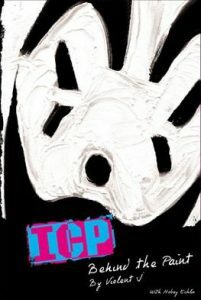 The Juggalo label deepened connections amongst fans as ICP’s popularity grew. People around the world began to identify themselves as a part of the Juggalo family. Connected by one common term, Juggalos became a family that strived to accept anyone, no matter their social class, gender, or family background. 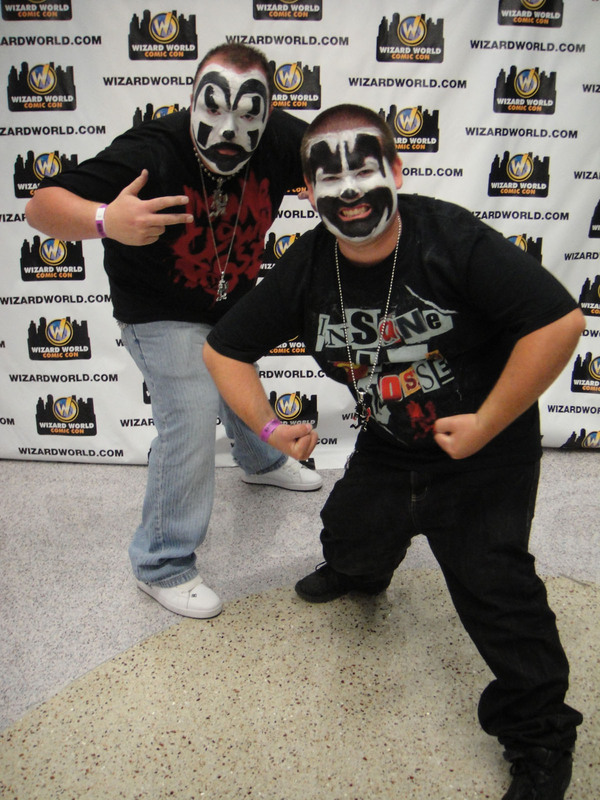 The two main singers of Insane Clown Posse Shaggy 2 Dope (left) and Violent J (right). Insane Clown Posse is a hip-hop group that focuses their song lyrics on social problems such as abuse and poverty (Neely 2014). As the Juggalo fan-name spread, their music began to reach people who suffered from those hardships and more. Most Juggalos live in poverty throughout the US, and many don’t have enough money for mainstream food or clothing (Echlin 2003). Instead of letting their poverty discourage them, Juggalos choose to embrace it. Similar to other subcultures such as skinheads, Juggalos accept anyone into their family and celebrate each other’s diverse socioeconomic statuses. Even female Juggalos have their own name, Juggalettes, proving the fact that Juggalos are so much more than just white, working class men. Juggalos at an Insane Clown Posse gathering. The Juggalo lifestyle represents different meanings for different individuals. Whether someone becomes a Juggalo to distinguish their identity or to have a group to call family, Juggalos are committed to make everyone feel at home. As one Juggalo stated, “Juggalos are not the kind of people who judge people. That’s why I love this. I can be myself!” (Halnon 2014). Whereas Juggalos are usually outsiders in their daily lives, when they are together, they are accepted and embraced for being who they are. Although Juggalos have similarities to other subcultures and see themselves as a family, in 2011 the FBI labeled them a gang because of their ‘criminal associations’. As hurtful as that label was for many Juggalos, once a year they put their troubles aside and gather from all around the world to a central event called Dark Carnival where they are able to reunite for a weekend to listen to music and have fun. Dark Carnival is an event held once a year where Juggalos from around the world are able to gather and spend a week together as a family (Halnon 2014). During this week long event, Juggalos partake in activities such as listening to music, going on carnival rides, smoking, and drinking with their Juggalo family. Some Juggalos partake in recreational drugs and drinking at dark carnival, but these activities are not required, and it is not frowned upon to choose another activity. Juggalos meet friends for life at Dark Carnival, and some even bring their partners or families to participate in the festivities (Greener 2011). Even though Juggalos associate themselves with the group for reasons they may get judged for in their daily lives, Juggalos embrace these differences at Dark Carnival, some even describing it as “the ultimate experience” (Halnon 2014). At Dark Carnival Juggalo demographics vary, but all are accepted. For example, although black Juggalos are often underrepresented, they still feel a part of the community. One black Juggalo stated about her Juggalo experience, “I don’t see a lot of us [black Juggalos] out there obviously, but when I go to a Gathering or concert, I don’t even feel different. It’s really not about skin color, it’s about family” (Watson 2017). This documentary takes place at the Gathering of the Juggles and features interviews with Juggalos about the yearly event. Faygo Shower at Insane Clown Posse concert. Most subcultures around the US have material items or a language they use to connect and identify each other with— Juggalos are no different. At Dark Carnival a material item which Juggalos use to connect is Faygo Soda. Faygo is an inexpensive soda which Juggalos spray and dump on each other at the gathering to symbolize a baptizing of poverty (Halnon 2014). Faygo symbolizes that Juggalos aim to embrace and make the most of what they have, so by showering themselves with this inexpensive soda, they are demanding affirmation as humans despite the poverty that most Juggalos around the world live in. If you were walking around at Dark Carnival not only would you likely be offered multiple kinds of Faygo, but you’d also hear people shout “whoop whoop” at you many times. “Whoop whoop” isn’t an offensive or derogatory term, but it a piece of Juggalo subcultural language which represents friendship and acceptance. While most Juggalos are hard to recognize in their day-to-day lives, the symbol that does represent their unity is the ‘hatchet-man’. At first sight an outsider might think this little hatchet-man symbolizes violence, in actuality, he represents much more for the Juggalo culture. Originally the hatchet-man was the marketing symbol for Psychopathic Records, but he was eventually adopted as the Insane Clown Posse logo, which lead to Juggalos viewing him as their unifying symbol. The running position and hatchet that the hatchet-man obtains represents Juggalos taking a running stance through life, always facing the future, and cutting down any obstacles they come across. One of ICP’s most popular songs is titled Chicken Huntin’ which was released in 1994. From first glance this song sounds incredibly violent as the lyrics go; “So tell Mr. Billy Bob I’m a cut his neck up. Slice, poke, chop chop, stab, cut.” Despite the violent lyrics, there is actually a lot more to this song than meets the eye. This song actually originates from a Juggalo’s experience before joining the group when he lived in North Carolina and witnessed act after act of racism toward African Americans and hatred toward minority groups. Juggalos thrive on diversity and accept anyone, “men, women, black, white, brown, yellow, fat as f***, skinny as a broomstick, gay, straight, bi, trans, young, old and folded and loopy, rich, poor” (Watson 2017). 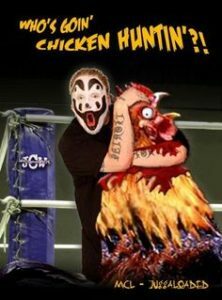 Thus, Chicken Huntin’ is about the hatred Juggalos feel toward southern rednecks who are discriminatory and racist. Since most Juggalos come from minority classes, they are strong advocates of promoting equality. Juggalos are a group of lower class outsiders who resist societal norms, but are bonded by their common love of friendship, individualism, and music. Although Juggalos view themselves as a family who faces struggles together, in 2011 the FBI put a damper on their subculture by classifying them as a gang (Linnemann 2016). Whether it be because of their clown face paint, hatchetman symbol, or song lyrics with deeper meanings, after the FBI report was placed society began to fear this now ‘gang’ involved subculture. The FBI report stated that Juggalos are a violent gang, often involved with criminal activity. This classification disrupted Juggalo events and gatherings as many members lost their jobs, and cities were scared to host Juggalo events (Linnemann 2016). Juggalos continued to stand together and support each other after this event, but there was no denying that this FBI report negatively affected their already poverty-driven lives. This documentary takes an in-depth look at the Juggalo March on Washington during an interview with Shaggy 2 Dope and Violent J.
Juggalos have a history of commodification different from other subcultures. When a business chooses to commodify something they take positive aspects of it that are easy for the public to consume. For instance, the retail store Hot Topic originally commodified Juggalos by selling their symbolic Faygo soda (Steinberg 164). After 2011 when Juggalos were given the ‘gang’ label from the FBI all traces of Juggalo commodification disappeared from stores (Linnemann 2016). This subculture that was once readily consumed by the public is now in a place that businesses want nothing to do with. The most typical type of people who identify as a Juggalo are white men living in low, poverty socioeconomic classes. Naturally this socioeconomic class has much stigma associated with it, and because of their gang label, Juggalos have even more negative stigma related to their low-class status. Whether it be their obscure song lyrics, violent looking hatchet symbol, or clown makeup, Juggalos are faced with many negative stigmas. Instead of letting these stigmas bring them down, Juggalos embrace it. By embracing their variety of typically unfavorable stigmas, Juggalos show the public they don’t care what others think of them. This documentary takes place at Dark Carnival and features one-on-one interviews with Juggalos about their experiences of being in this subculture. This documentary shows live clips from the Juggalo March on Washington to protest the Juggalo gang label which took place in fall 2017. At first listen the ‘Chicken Huntin’ song sounds incredibly violent, but in actuality it is about how Juggalos are anti-racist and anti-hatred. This video contains a mashup of different clips of other Juggalo music videos and concerts. 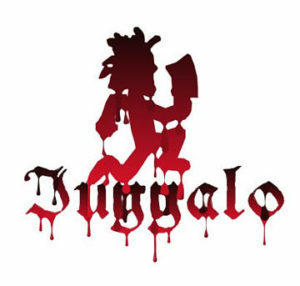 ‘The Juggla’ was the song being performed at an ICP concert in 1994 when Violent J and Shaggy 2 Dope first began to call their fans Juggalos. The following is the lyrics video for ‘The Juggla’. Juggalo Homies depicts how close Juggalos are and the various ways they identify themselves as a family. The following video is the music video for Juggalo Homies. 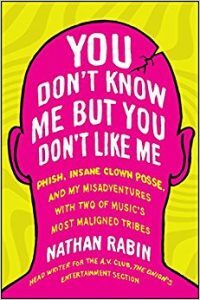 This book is an autobiography by Violent J depicting his experiences and time as a Juggalo. 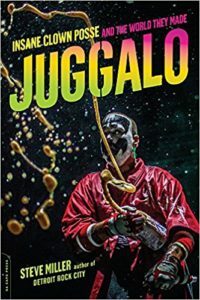 This book follows and interviews Juggalos around the world, talking about their experiences of being a Juggalo and how gatherings shape their lives. The author of this book followed Juggalos for two years to learn about their fanbase and how important their community is. Fudge, Zachariah D. 2014. “Gang Definitions, How Do They Work? : What the Juggalos Teach Us About the Inadequacy of Current Anti-Gang Law.” Marquette Law Review 97(4):979–1037. J, Violent and Hobey Echlin. 2003. Behind the Paint. Psychopathic Records, Inc.
Halnon, Karen B. 2014. “Dark Carnival and Juggalo Heaven: Inside the Liminal World of Insane Clown Posse.” Advances in Social Sciences Research Journal 1(2):84–98. Monaster, Vinnie. 2014. Ask a Juggalo. Detroit Metro Times. Watson, Elijah. 2017. “Female Juggalos Marched On Washington, Too — And They Want You To Know Their Community Is Not Just For Men.” Bustle.